Use this page to estimate your cost and break even sales point that will pay for the Downloader. After the break even point, all profits are yours to keep. Starter Packages are for 8 songs - (30 minutes max) or 14 songs - (70 minutes max). 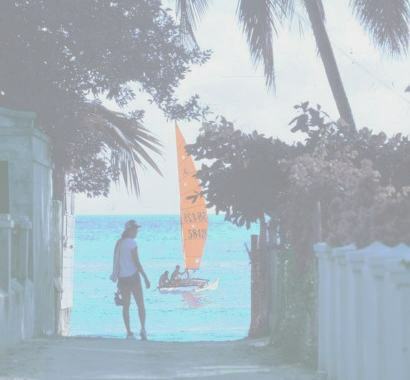 These packages include song previews and downloads in any one format: MP3 (any bit rate), Flac, Wav or Aiff. You may choose to withhold tracks from song downloads and make them album only. Colors can be changed to match your web site theme. You must start with Package #1 or #2. Encode more songs in the same audio format as the package above. This option makes the song previews and gives the new songs passcodes for downloading from the page. List extra songs with a custom preview only. The download of this song will be just in the album download. Instead of a passcode to download the song it will have "Album Only" text. This is often used to promote selling the whole album. Your client has to buy the album to get these selected songs. Make copies of songs in a different audio format - either a second MP3 rate, or to a Flac, Wav or AIFF format. This buys you encoding and a button for download only. You can request to put the extra download buttons in a row, after each song - [MP3] [Flac] [Wav] [AIFF]. For example, a 3 way setup like this, would let the user download each song they purchased, 3 ways, in MP3, Flac and Wav, all for one price. If you want more control with separate passcodes and different pricing options per audio type, then you need to also add an Extra Song Downloader Page in the next section. 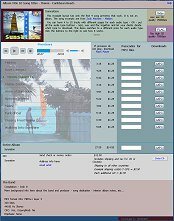 Example A - Select Package #2 and encode 14 songs 3 different ways in [MP3-192] [MP3-320] and [Flac] and have all three links for each song on the same downloader page. Select "Extra audio format: encode + button links to songs - 28" because the first encode type of 14 encodes is already included in Package #2. You only need 2 x 14 encodes = 28 encodes for the remaining two audio types. Example B - Select Package #2 and encode only 10 songs for individual release (leave 4 songs for album only) and the same 10 songs for Flac release with a separate passcode page for Flac. 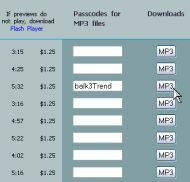 Select "Extra audio format: encode + button links to songs - 10" here and "1 Extra Song Downloader Page" below. 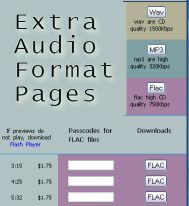 Add an Extra passcode downloader page for Flac, Wav or AIFF downloads. The extra page allows you to set different pricing per song and per format. The Extra Page only duplicates the song list and previews to download in another format. It does NOT add new songs. The Extra Song Downloader Page does not include the encoding cost for the songs. Please add the number of Extra audio format encodes above. You probably want to match the same songs to be available in all formats, but you don't have to do this. You can make some songs available only in some formats. All songs are always available in the complete album download. The Extra Song pages look almost identical. Only the buttons, color code, pricing and audio quality info will change. One click of a button moves between the audio types. See the demo page for an example of Extra Song Downloader Pages in action. If you supply an image, (minimum size 800 x 1000 pixels) of which you own the rights, choose "No". Putting an image you supply behind the preview buttons is included in the package above. This is just to purchase the image rights of one of our photos. Some photo examples are here. The Collection Slider can show your albums and each album can link to either a new Song Downloader Page, or to a pop-up email window, or anything else you wish. If you want the Slider to open a New Passcode Song Downloader, you need to order a separate Passcode Song Downloader package for each album. In the meantime, you can set the other albums in the slider to email or go to another page on your site. See the demo page for an example Collection Slider in action. PayPal notifies you of sales. You must send emails to buyers with download info to complete the sale. Shopping cart sales automatically sends an email to buyers with song download info. Clients can also pay immediately with Pay-Pal or Credit Cards. Since there is no outside vendor, there are no sales commissions, only payment fees. The musician, content owner, can have admin access and can add new music to the shopping cart for Credit Card and Pay Pal sales. Passcodes sales still require setup fee, per CD.